Dag Nasty, a band with many lineups over the years, has a new spinoff-type reformation named Fied Day. Field Day features former members Doug Carrion and Peter Cortner, plus former Down By Law guitarist Mark Phillips. The trio will be playing dates in 2019 and plan a new release inn 2010. Carrion and Cornter played on Dag Nasty's Wig Out at Denko’s (Dischord Records) and Field Day (Giant Records) in the late 1980s. 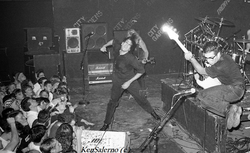 As the current Dag Nasty lineup plays shows, Brian Baker met with Carrion and Cortner to discuss how to handle songs from time in the group, leading to the Field Day name to limit confusion for fans and promoters.